I was a huge fan of Saved by the Bell when I was a kid, and I watched it religiously, like many others my age. I thought Zack was so handsome, and Jessie was so smart, and Lisa was so cool. Even though I have a different perspective on the show now that I'm older (and I'm also a high school teacher), I still have soft spot for it in my heart. So when I saw this modernization of SBTB in comic form, it really piqued my curiosity. How would our favorite Bayside High supergroup fare in the 21st century? How would things be different? Would Jessie be an advocate for more social issues than just her stereotypical brand of feminism? Would Lisa have a fashion blog? Would a nerd like Screech be actually... COOL? Well... this book offered some answers, though they weren't as satisfying as I had hoped. In fact, I only got through 50% of this before I was like, Okay, I got the picture, and I am disappointed. Things are updated in that they have Internet now, and their appearances are a little more in keeping with current fashion (though, not much - it still looks early 90s to me), but that's about it. Not much else was changed, though I guess for some people that might be a good thing - it still has the same corny humor as the original show, it still relies on the same stereotypes, it still has Screech refusing to take no for an answer even though there have been a lot of cultural conversations about Nice Guys and Nerd Boys Who Don't Respect Women's Boundaries. It still has Zack being douchey and slimy and getting away with stuff that as an adult and a teacher I find problematic. It still doesn't have any Asian people or or LGBT characters or intersectional feminism (at least, in the parts that I read). It still has Lisa being rather mean to Screech, so any headway our society has made about not bullying or not being judgmental or whatever stuff about accepting others as they are isn't really reflected here either. It still has Kelly and her conventional brand of beauty being the epitome of desirability. This was meant to be a fun, light read for people who are fans of the original show, and if that's all you're looking for, then on that note, this book really succeeds. It really does. It is quite literally the Saved by the Bell you know and love, just with smaller cellphones and smaller hair. But if, like me, you were hoping to see if this update would really reflect how our world, and especially the teen world, has changed since the days of the original tv series, then like me you too will be disappointed. Look - I'm a high school English teacher. 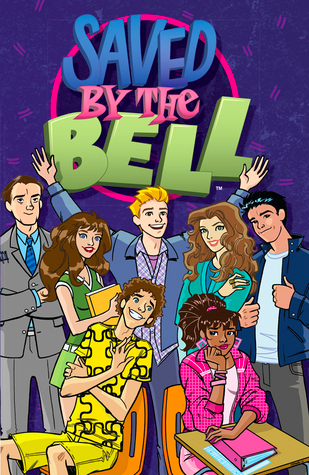 I even teach freshmen, which is the grade that the SBTB gang are supposed to be in this comic book. And yeah, my kids' worlds consist of cell phones and sports and cheerleading, even, but they also consist of a whole lot more. This is a world where teens have to deal with bullying in person and online. It's a world where we have regular conversations about gender roles and sexuality and Internet safety. And again, I know that this is a fluffy modernization of a fluffy teen sitcom, but even the teens in modern-day sitcoms are more worldly and sophisticated than they used to be in the original days of SBTB, even in Disney Channel shows. And just look at how much YAF has changed since then - this is a world where teens read writers like John Green, Sarah J. Maas, Cassandra Clare, and JK Rowling. And none of that is reflected even a little bit in this modernization. But oh well... this is someone else's interpretation and someone else's artistic choices, so I shouldn't get so upset. I don't know, I just had really high hopes, I guess. Anyway... I personally didn't like it, but I'm definitely not saying that you shouldn't read it or give it a shot. It just wasn't what I wanted. And I am only one person.